For introductory information about Automation Server, refer to Automation Server. The information presented here provides a quick reference for you to estimate hardware sizing (especially in terms of processing and memory) for the specific requirements of your project. Bizagi is highly scalable, allowing you to scale out or scale up your system architecture at any time. Include additional nodes having Automation Server (scale-out) by ensuring these are considered within your load balancing cluster. Regarding the database server, scaling out is available as supported by the database engine technology (e.g., Oracle RAC supports an active-active scheme). 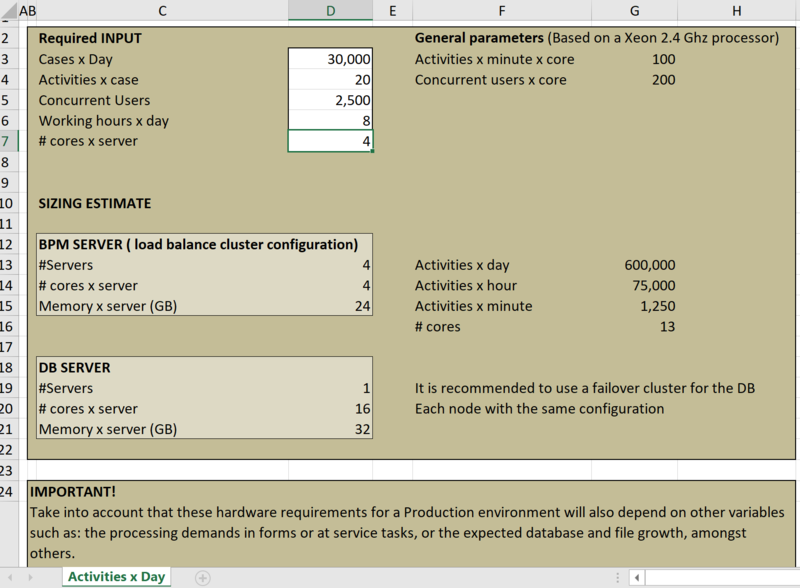 Otherwise and for instance for SQL Server, scale up your servers. It is critical for your production environment to rely on an estimate of the necessary resources to have Bizagi perform optimally while supporting your business' demands. Minimum system requirements for Automation Server, according to your specific platform, are those presented at System requirements. Conduct a sizing analysis for your project (i.e, to determine if you need additional nodes for the cluster, and the RAM memory or CPU processing needed), by using our Bizagi Sizing Estimator. Automation Server while in a server employing a single core of a 2.4 GHz processor, and using 4GB of RAM, typically processes approximately 100 activities per minute (i.e workitems). Achieving scalability in a Bizagi project is easily done by involving additional resources as per the measure provided above, while choosing horizontal scalability at best. Variables affecting your environment's performance include: the number of concurrent users, the demanded processing behind, the estimated size and amounts of documents (file attachments), aspects regarding integration with other corporate systems, and the amount of daily cases or activities, amongst others. You may download here a PDF document containing case studies of Bizagi system architecture, in which operating environment setups are illustrated for large scale corporate projects having high processing volumes.